Sea Launch Lofts Koreasat 5 - Universe Galaxies And Stars Section. 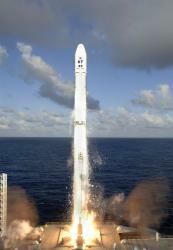 Sea Launch Lofts Koreasat 5. Koreasat 5 launch. Image credit: Boeing. A Zenit-3SL vehicle blasted off Tuesday morning from the Sea Launch facility, carrying a Koreasat 5 telecommunications satellite into orbit. The launch occurred at 0327 GMT (11:27pm EDT, Aug 21), and the spacecraft was placed successfully into a geosynchronous transfer orbit about an hour later. The satellite will operate at 113 degrees east, and provide both commercial and military communications services. Sea Launch Company today successfully delivered the Koreasat 5 communications satellite to geosynchronous transfer orbit (GTO). Early data indicate the spacecraft is accurately positioned and in excellent condition. A Zenit-3SL vehicle lifted off at 8:27 pm PDT (03:27 GMT, Aug. 22) from the Odyssey Launch Platform, positioned at 154 degrees West Longitude in the equatorial Pacific. All systems performed nominally throughout flight. The Block DM upper stage inserted the 4,448 kg (9,806 lb) Spacebus 4000 C1 platform to GTO, on its way to a final orbital position of 113 degrees East Longitude. A ground station at Fucino, Italy, acquired the first signal from the satellite shortly after spacecraft separation. Built by Alcatel Alenia Space for the KT Corporation and Korea's Agency for Defense Development, the hybrid multi-band satellite will be part of South Korea's new high-capacity Spacecom System over the Asia-Pacific. This is Sea Launch's fourth successful mission of 2006 – two additional missions are planned for this year.